I am a member of the Database, Data Science, UW Reality Lab, and AstroDB groups at UW. 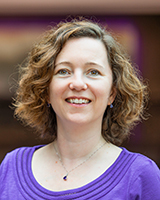 I'm also the director of the University of Washington eScience Institute, the director of the IGERT PhD Program in Big Data and Data Science, and the co-founder of the Northwest Database Society (NWDS). PC co-chair for PVLDB vol 13 aka VLDB'20. General chair for SOCC 2019. Head PC Co-chair for CIDR 2019. I lead the organization of the first UW Data Science Summit. Keynote talks at SOCC 2017 and Middleware 2017. Recipient of SIGMOD's Test of Time Award (2017)! Check out my new classes on Big Data Management Systems and Scalable Data Systems and Algorithms. PipeGen source code is now available online. PC Co-chair for CIDR 2017. The Myria big data system is now easier than ever to deploy on Amazon EC2. You can also test our demo deployment on Amazon. PSLAManager source code is now available online. Keynote talk at VLDB 2015. Magdalena Balazinska is a Professor in the Paul G. Allen School of Computer Science and Engineering at the University of Washington and the Director of the University of Washington data science institute called eScience. She is also the Associate Vice Provost for Data Science and the director of the Advanced Data Science PhD Option. Magdalena's research interests are in the field of database management systems. Her current research focuses on data management for data science, big data systems, cloud computing, and image and video analytics (including data management for VR/AR). Magdalena holds a Ph.D. from the Massachusetts Institute of Technology (2006). She is a Microsoft Research New Faculty Fellow (2007), received the inaugural VLDB Women in Database Research Award (2016), an ACM SIGMOD Test-ofTime Award (2017), an NSF CAREER Award (2009), a 10-year most influential paper award (2010), two Google Research Awards (2011 and 2018), an HP Labs Research Innovation Award (2009 and 2010), a Rogel Faculty Support Award (2006), a Microsoft Research Graduate Fellowship (2003-2005), and multiple best-paper awards.